Compound is a substance of atoms of two or more elements formed by the chemical combination in a definite proportion by weight. For example, water is a liquid compound of hydrogen and oxygen in which two elements are present in fixed ratio of 1:8 by weight. The smallest particle of an element or compound, which is capable of independent existence is called molecule. It retains the properties of its own. It is very small. It is difficult to estimate the size of a molecule or to determine its shape. The smallest particle of an element, which takes part in chemical change is called anatom. Atom is made up of tiny particles. These tiny particles are called sub-atomic particles or elementary particles. They are electrons, neutrons and protons. 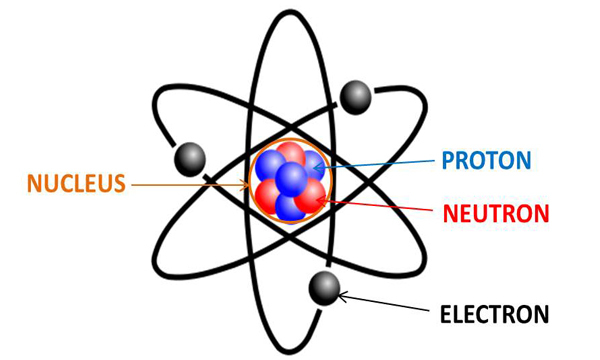 The protons and neutrons are located at the center of an atom called nucleus. Nucleus shows the positive charge due to thepresence of protons. It helps to find the atomic weight. The electrons are revolving around the nucleus in their respective orbit or shell. The number of protons or the number of electrons in an electrically neutral atom of an element is called atomic number. It is denoted by Z. The sum of protons and the neutrons in the nucleus of an atom is called its atomic weight. It is also called mass number. It is denoted by A. The systematic distribution of electron in different shells of an atom is called electronic configuration. The maximum number of electrons in each shell is determined by 2n2 rule, where n is the number of the shell. The maximum number of electrons in the outermost orbit is 8 and in second last orbit is 18. It is not necessary for an orbit to be completed before another begins. The energy level or shell nearer to the nucleus s called lower energy level and energy level way from the nucleus is called higher energy level. The smallest particle of an element or compound, which is capable of independent existence is called molecule. The smallest particle of an element, which take part in chemical change is called atom. What is a compound? Give two examples. Compound is a chemical substance which is formed by the combination of two or more elements in a fixed proportion by their weight. E.g. water (H2O), Ammonia (NH3) etc. The systematic distribution of electrons outside the nucleus in different shell is called electronic configuration. Write down the electronic configuration of sodium and chlorine. The fundamental particles which are found inside an atom are called sub-atomic particles. Electrons, protons and neutrons are the sub-atomic particles. Differentiate between atom and molecules. The smallest particle of an element which takes part in chemical reaction without division is called atom. The smallest particle of an element or compound which is capable of independent existence is called molecules. Atom of an element can't be divided into two or more parts. For e.g O, H, Na, N etc. Molcules can be divided into two particles. For e.g O2, H2, N2 etc. Differentiate between proton and neutron. They are positively charged sub-atomic particles which are present inside nucleus of an atom. They are charge less sub atomic particles which are present in the nucleus of an atom. They have equal mass to the hydrogen atom. They have charge equal to hydrogen atom. Differentiate between neutron and electron. They are charge less sub-atomic particles which are present in the nucleus of an atom. They are negatively charged sub-atomic particles which are present outside the nucleus in different shells. Their mass is regarded as 1 (a.m.u) i.e. 1 atomic mass unit. They have mass equal to 1/1837parts of a hydrogen atom. Differentiate between proton and electron. They are positively charged sub-atomic particles which are present inside nucleus of an atom. They are negatively charged sub-atomic particles which are present outside the nucleus in different shells. They have mass equal to the hydrogen atom. They have mass equal to 1/1837parts of a hydrogen atom. What do you mean by diatomic molecule? Give two examples. The molecules which are made by the combination of two atoms of a same element are called diatomic molecules. E.g. : H2, N2 etc. What are valence electrons? Explain with examples. Electrons or pair of electrons present at the outermost shell of an atom is called valance electrons. Valance electrons in hydrogen, nitrogen, and chlorine are 1, 5, and 7 respectively. Why potassium chloride is called ionic compound? Potassium is a metal and chlorine is a non-metal. Potassium loses one electron and becomes positively charged and chlorine gains one electron and becomes negatively charged. So, potassium chloride is called ionic compound. Differentiate between chlorine atom and chlorine ion. It is electrically natural. It is negatively charged. It has equal number of electrons and protons (i.e. 17 each). It has more electrons than protons (i.e. 18 e- and 17 P+). It has 7 electrons in the valence shell. So it is very reactive. It has 8 electrons in the valance shell. So it is non reactive (very stable). Atom is electrically neutral. Ion is (+) or (-) vely charged. It has equal number of protons and electrons. It does not have equal number of protons and electrons. It has usually less than eight electrons in its valence shell. It has usually eight electrons in its valence shell. Define cation and anion with examples. Cation: The positively charged ion is called cation. For e.g. : H+, Na+, Mg++ etc. A cation is formed by losing one or more electrons by an atom. Anion: The negatively charged ion is called anion. For E.g. F-, O--, Cl- etc. Ionic compounds are mainly solids. Covalent compounds may be gases, liquids or solids. They consist of ions. They consist of molecules. They have high melting point and boiling point. They have generally low melting and boiling points. They conduct electricity in solution. E.g. NaCl, CaSO4 They do not conduct electricity in solution. Observe the given table and answer the following questions. What is the valency of A? Why? Which elemts is more reactive between C and D, why? Write down the molecular formula of the compound formed by the combination of B and C. Which type of bind is formed in between them? The valency of 'A' is 2, because it needs two electrons in its valence shell to get its octate state. D is more reactive than C because it lose 1 electron during chemical reaction and is electropositive, but c is electronegative and receives one electron during chemical reaction to be stable. B and C forms AlCl3 and contains ionic bond. The atomic number and atomic weight of sodium (Na) are 11 and 23 respectively. Find the number of electrons, protons and neutrons of sodium atom. Number of protons (P+) = ? Number of electron (e-) = ? Number of neutrons (no) = ? Atomic number = number of protons = number of electrons. Atomic weight = Number of protons + Number of neutrons. The weight of an atom expressed by comparing with hydrogen atom is called relative weight. A hydrogen atom includes only one proton in its nucleus. Therefore, it is considered as 1. Why carbon dioxide is called co-valent compound? Carbon and oxygen both are non-metals. Carbon needs four electrons to fulfill octet and oxygen need two electrons to fulfill octet. So, both combine together by sharing two electrons. So, it is called co-valent compound. Which is not a compound? Which is false regarding atoms? What does a.m.u stand for? What is an e.s.u measures? A molecule is usually stable to exist by itself but an atom is not stable by itself. What is the number of neutron if atomic number is 15 and atomic mass is 31? What element has atomic mass 23? What is an element of atomic number 13? What is the relation between a.m.u and e.s.u? What is electronic configuration of magnesium (At no:12)? Total electron in P shell is? Which is false about electron distribution outside nucleus in various shells? How many electrons are there in the valence shell of silicon (At no:14)? In Calcium, how many valence electrons are in which shell (At no: 20)? Which is not a metallic compound? Which is a metallic compound? One metre is equal to______ wavelength in vacuum of transition of _______ atom. Any Questions on 'Compound '?